Wednesday, August 2, 12:00 p.m. - 5:00 p.m.
One of America's most popular adventures, whitewater rafting is becoming a tradition for visitors to Northern New Mexico. 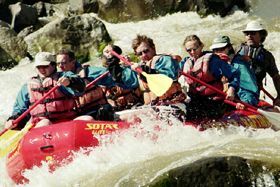 The rafting season begins with the snowmelt in spring and generally lasts through October. The runoff will be lower in August, so the rapids will be less intense and there will be some floating. All levels of rafters, from the novice to the expert, will enjoy this adventure along the Rio Grande. 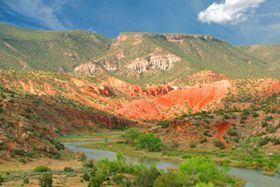 Along the valley floor, experience spectacular scenery, with a full range of whitewater on the "Racecourse" south of Taos. Due to safety regulations, no one under the age of seven years old or in excess of 230 pounds will be permitted to participate in this event. Waterproof suits and helmets can be provided upon request. If desired, bring extra clothing to change into at the take-out point. COST: $150 per person includes transportation, guide, bottled water and boxed lunch on board, half-day rafting, rafting guides and all gear, gratuities and tax. a small selection of galleries that showcase the breadth and depth of artwork on Canyon Road. Delve into the work on view through activities that encourage deep looking, chat with local artists and gallerists, and discover the history of this charming neighborhood. COST: $50 per person includes transportation, guide, gratuities and tax. Limit of 24 participants.